First of all – I’m really exited to announce the first ever Lax Goalie Rat intern! It’s Jack Nydick, a high school sophomore goalie out of New Jersey. He’s been playing goalie for 7 years now and completely fell in love with the position and the game so he officially qualifies as a lax goalie rat. Jack has played for team Israel as well as tought Israeli youth lacrosse. He hopes to play in college and is beginning the recruiting process. For his first official task in the Lax Goalie Rat enterprises I sent him the Maverik Rome Goalie Lacrosse Chest Pad – ’19 Model to play with and review. This chest pad comes from their Rome line of protection and I’ve previously reviewed the Maverik Rome NXT goalie gloves. Here’s the chest pad review. In the past few years, the chest protector I was using was sized as a large, but fit more like a small. After getting a few hard shots to the stomach, I felt it was definitely time for a new chest protector that not only fit comfortably but kept a similar weight and tight feel. Goalies often think that coverage from head to toe is essential but for me finding a good balance between maneuverability and padding is very important. For some goalies, I believe that the Maverik Rome 2019 edition might be the perfect balance. This is my review of the Maverik Rome chest protector – 2019 model. The Maverik Rome chest protector, the newer version of the Maverik RX3 chest protector, is an enhancement to its predecessor. Maverik made many important adjustments that protect the areas where goalies get hit quite often. The coverage of the chest protector now fully covers the bottom half of the torso and is comfortably tight-fitting at the top. Also, the shoulder and collarbone protectors are customizable with velcro pads which gives additional protection in those important areas. Your stomach is fully covered and able to absorb any low to high shots that you get behind. The Maverik Rome has a cutout in the collar to make room for your throat guard and it fits seamlessly into the pad. If you set the collar pads high enough, your arms can get across your body with zero resistance. But it did take some time to adjust the top straps to a position where they didn’t detach on offside saves and it still happened from time to time. If properly tightened, it is very snug. Additionally, the chest protector is extremely light, weighing in at only 1.2 pounds. It is very flexible and has moisture-wicking technology to keep both you and the pad dry. I have not had to let it dry out for more than an hour. This pad is better for goalies that need more protection on the upper chest and it makes you feel as though you have more padding without feeling heavier. The Maverik Rome has the patented Poron XRD which is a lightweight foam that absorbs up to 90% of high speed impacts and is used in many construction companies to protect workers. This foam is very flexible and light-weight. It does not get in the way of your movements because of its grid pattern that bends and folds with your movements. It is a little bulky and takes up a lot of space around your shoulders, while this is good for protection it isn’t good for those off stick high saves. When my arms crossed, the collarbone pads would inadvertently pop off the velcro. As I said before, it covers your entire frame and is very easy to get as tight or as loose as you want. The Maverik Rome chest pad has no gaps in padding and bends well even during very awkward or unusual movements like falling or split saves. The Maverik Rome has a very clean and crisp design. It comfortably fits under most pinnies and game jerseys. The pad itself does not appear to add much bulk, although it can feel awkward by the upper chest. The blue and grey color scheme looks really modern and gives off an almost futuristic look. The cool rigged scale-like pattern may attract many buyers, but I would keep in mind that the collar bone protectors are slightly bulky during the shopping process. The current price of the Maverik Rome is $150.00. If you don’t mind having a little less protection in trade for slightly more mobility and a lower price, I would go with the previous model: Maverik Rome RX3. But if you are a younger goalie and enjoy feeling more protected around your shoulders, I would suggest investing in the new Maverick Rome. You can purchase the Maverik Rome Chest pad on LacrosseMonkey for $149.99. You should go with a size smaller than suggested unless you are a very large goalkeeper. Through this review process, I learned that the current trends seem to be leaning towards greater amounts of padding in order to ensure that the chest protector soaks up the majority of the impact. The 2019 version of the Maverik Rome chest protector covers more without being heavy and because of its large coverage area, you don’t feel the shots to the body at all. In comparison to the Maverik Rome RX3, this new chest pad is a step up if you are looking for more protection, but it’s bulkiness does impact your range of motion. The style of the Maverik Rome, has a very cool design and once broken in, the pad fits comfortably if it’s tied to the body tightly. All in all it’s a great pad for the developing keeper or a goalie that likes some extra protection, it’s very hard to go wrong with this pad. Thanks Jack for testing out Maverik’s latest chest protector and writing up that great review. What do you guys think? Anyone out there made the switch to the new Maverik Rome chest pad? What are your thoughts? 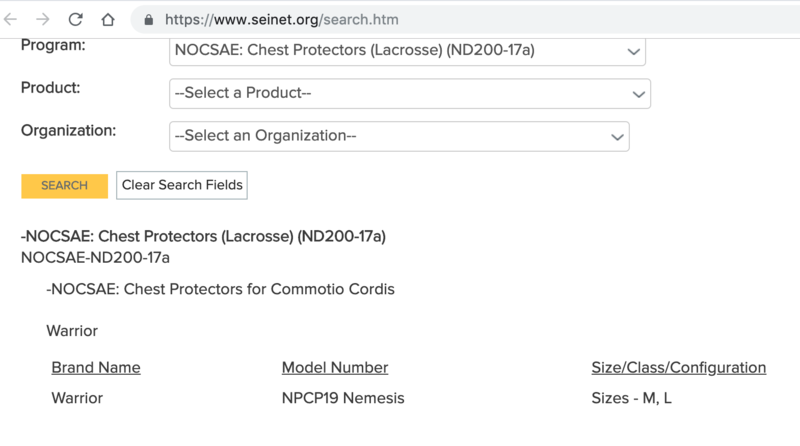 Does this new chest protector comply with the new NOCSAE standards for 2020? The maverick Rome adjustable collar makes this chest protector tempting. My goalie uses the unequal technology chest protector. The shot absorption is the best we’ve found on the market. Also, I have 4 daughters who are goalies, ages 6-14. Let me know if you want a girl’s opinion on gear. Do you have a problem with your helmet catching on the chest protector? The one I have ends up catching on my helmet and I’m unable to move my head from the chest pad. Like the throat guard catching on the chest protector? Never had the helmet itself do that but occasionally would happen with my throat guard. It’s my throat guard, I have tried a couple different throat guards but they still catch on the chest protector every time I turn my head. Ive been using this chest protector for a couple months now and the amount of times my throat guard has gotten caught on it can be counted on one hand. I contacted Maverik last week about my issue with it but still haven’t gotten a response from them. Thanks Leah! Let me know what they say if they do respond. Thanks Leah!! Stay on them haha – let me know what they say!